While in Morocco, Dan and I had the unique opportunity to spend the day with a friend of one of Dan’s friends. Mhammad Benaboud is a native of Tetouan, a town about an hour’s drive from Tangier. He has spent most of his life having a love affair with his native town. And, he has been lucky that his financial circumstances have allowed him to recently pursue one of his great passions, the restoration of various historic homes in the ancient Medina of Tetouan. He has bought, and is now restoring, about six homes. We tagged along with him on a tour of the homes. It was akin to taking a college course, right on site. The restorations are meticulous. Mhammad is adamant that all work is done using the same materials as the original. The result is a step back in time, a look at how these homes looked hundreds of years ago, when they were first occupied. The homes we toured were in various stages of restoration. We stepped over a lot of debris and inhaled a lot of plaster dust. While doing so, Mhammad never stopped talking. Ancient Tetouan came to life, as vividly as the stunning Moroccan tiles that lavishly covered floors, walls and fountains of all the homes. Readers have already read about my experiences with genealogy and, specifically, locating mezuzah tracings in Pinsk, the shtetl in which my father was born. Thoughts of this were not in my mind when we toured one of the homes, almost completed, in the old Jewish quarter of Tetouan Medina. But there, right in front of me, was a mezuzah tracing, on one of the doorways. Then a second tracing, on another doorway. Mhammad had chosen not to fill them in when the renovation was being done. It stopped me in my tracks, again bringing up many of the same feelings I had when I saw the mezuzah tracings in the photos of the building in Pinsk. Here were people who lived and loved and raised families and worshipped, for five hundred years. Then they left, taking their mezuzahs with them, in order to install in their new homes. Almost all of those homes were to be in the newly created state of Israel, about 2500 miles away. 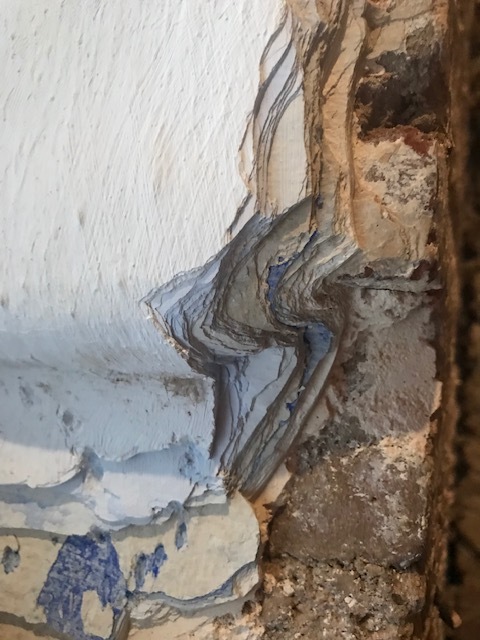 In the last property, a workman was chiseling away at the walls, releasing all of the built up layers of paint and plaster that had accumulated over 500 years. Pieces were everywhere. I looked down at the piles all around me. I stooped down and picked up a piece. I could see the countless layers of paint exposed. It was beautiful and evocative. After awhile, as we exited the home, Mhammad pulled me aside and told me that he had instructed the worker not to tamper with one area of layers of exposed paint that were in the doorway leading from the main front room. They would remain, so that those who followed us would be able to experience what I had. I thanked him. I don’t know if Mhammad will sell the home or keep it and turn it into a restaurant or a bed and breakfast. But I do know that whoever inhabits the space will be able to appreciate what I did, ordinary human lives navigating the centuries. I am grateful to Mhammad, for understanding. And I will never look at paint the same way again. lovely lovely. Thank you Renee. I feel the same way when I see old uninhabited farms in our area. Porches crumbling, roofs caving in, but a long time ago they were teaming with family activity. Kids in the yard and wash on the line. I always feel sad with homes are abandoned. I love what he is doing. Making them useful and happy again. Yes, I feel the same way about abandoned houses, no matter where they are. How fortunate you are to have had this experience and how sensitive you are to hear the voices of the past through the debris. Thanks, Philly. Yes, the gratitude never ends. And the voices always come through loud and clear. I may not understand the language, but I understand the words. Little pieces of the past in Dan’s pocket. What a meaningful keepsake for you to take home with you. Ah, thank you for these words. What a lovely post. It made me even more excited about our upcoming trip to Morocco next March. Hurray! Where in Morocco will you be going? Thank you for reading. I wish you the best in getting another cell phone.